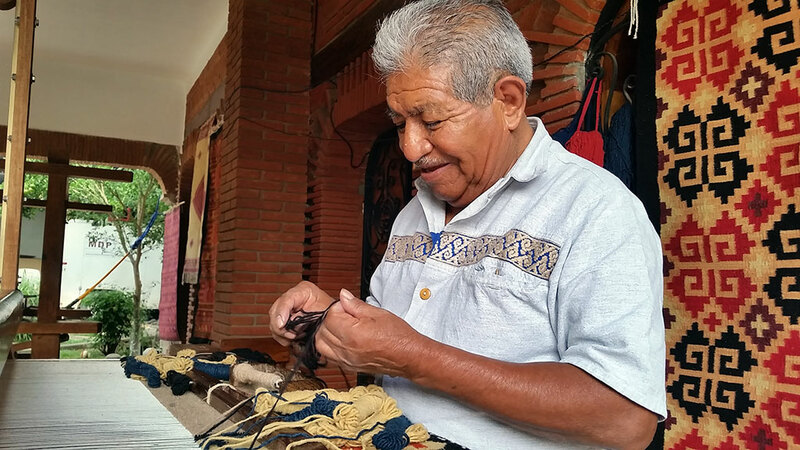 Master Zapoteca weaver at 88-years-old, J. Isaac Vásquez García is revitalizing the use of natural dyes. It is hard to make a case against the consistent quality of programs aired on PBS. Not only does public television in this country do everything right, content across its programming grid is always good. From feature documentaries to episodic drama and shows focused on the arts, science, history and everything in between, the award-winning excellence which imbues so much of what is ultimately selected for broadcast has never been compromised by its “educational” mandate. Occasionally, however, independent media makers, program developers and producers in the PBS orbit create something so much better than what could be found anywhere else—including commercial network, cable network and digital content production platforms—that we experience a kind of reunion honeymoon. More than simply rekindling our thorough infatuation with shows we adored as children, these exceptionally well-made programs and series are fueled by a bold, innovative vision through which they transcend the medium itself. Craft in America, the Peabody Award-winning series now in its 10th year on PBS, is a case in point as the kind of televised storytelling that pushes well beyond the screen as the fulcrum for: a movement to document and advance original handcrafted work; a nationally prominent non-profit organization established to further those objectives; and an exhibition and education center with a curatorial mission informed by a dedication "to the exploration, preservation and celebration of craft, the work of the hand, and their impact on our nation’s cultural heritage,” says Craft in America Director Carol Sauvion. On Friday, September 29th, beginning at 9pm, Craft in America presents “Borders” and “Neighbors,” two searing new one-hour episodes that take viewers to and from the U.S. and Mexico, exploring how aesthetics cross over from one country to another in a living and on-going cultural exchange. Both episodes introduce legacy artists who have contributed profoundly to the elevation of craft within the realm of visual and sculptural arts. Since this writer was interviewed on camera and appears briefly in the “Neighbors” episode with commentary on the work of glass artist Jaime Guerrero, it would perhaps be inappropriate to make an assessment of its merits as a documentary program. It is enough to say that both episodes also function effectively as self-contained installments from what might best be described as a culturally focused TV magazine. Vividly lensed and adroitly scored with love for the subject, Craft in America is, of course, entirely sincere in its appreciation for craft as a universal language that does away with borders. Opening with a tender look at the history of L.A.’s oldest Día de Los Muertos celebration through the eyes of “altarista,” artist and Eastside native Ofelia Esparza, “Borders” unfolds with a dazzling visual chemistry that is passed along from subject to subject connecting the people, their craft expressions and their histories seamlessly. The examination of East L.A.’s most storied Día de Los Muertos arts celebration is filtered through the distinctly personal childhood memories of more solemn Day of the Dead observances at the grave sites of loved ones “maestra” Esparza now often honors in her altars. From the visit with Ofelia and her daughters Elena and Rosanna Esparza as they create the colored tissue marigolds and gather the materials for the altar under construction, we travel to Teotitlan del Valle, Oaxaca for an insider look at workshops of a traditional Zapoteca family renowned for their skill and artistry as textile weavers. The family patriarch, master weaver J. Isaac Vásquez García, has helped revive the use of natural textile dyes extracted from insects and plants through processes that go back to the pre-Colombian era. Intimate interviews with his children reveal that they are all involved with extraction and production of dyes as well as the fabrication—using only hand tools—of the yarn from raw wool into thick twine and even the dying of the wool thread itself. This is what must occur before any yarn is loaded onto the looms, operated with both the hands and feet, upon which the richly colored rugs and textiles are woven. In a brilliant and masterful inverse circular transition—a credit to Sauvion and her production crew—Craft in America follows the introduction of Vásquez García and his extended family with observations contributed by a young Mexican-American woman from Los Angeles who is romantically involved with one of the younger textile artists in the family. Amidst the bustle of a crowded outdoor market, she speaks fluent English and expresses her awe and admiration for the family while they buy the bread, flowers and fruits and nuts which are necessary aspects of the way in which they welcome the spirit of “don” Isaac’s late wife María Vásquez each year. The look at textiles is a natural segue to conversations with several telegenic experts on traditional Mexican textile arts who also work as preservationists. Several remark with outright devotion on the role of legendary artist Francisco Toledo as the principal patron in the creation of the Textile Museum of Oaxaca. As with earlier segments, Sauvion and her editors manage to find the perfect thread—be it an individual, an art form, a geographical location, a piece of folk art or the artist under whose hands it took shape—with which to lead into successive subjects and segments. From the Textile Museum, for example, we follow long-time Oaxaca residents, Veralee and Jim Bassler—both avid folk art collectors as well as a potter and weaver, respectively—back to Los Angeles to for a thrilling insider look at the traditional Guelaguetza celebration which has become a major week-long event in L.A. as a result of the vast community of indigenous Zapoteca immigrants from Oaxaca who have settled in the southern California region. Informative to an almost muscular degree, “Borders” never drags or gets bogged down in the fusillade of new information loaded with names, dates, places artists, craft specialties from both sides of the U.S.-Mexico border. The delightful presence of Oaxaca-born artist Francisco Toledo in a segment on the Taller Arte Papel (Paper Art Workshop) cooperative is an understated coup given Toledo’s iconic, almost rock star status in the art world for his successful opposition to an attempt by McDonald’s to open a restaurant in the historical center of the city of Oaxaca. As an international art celebrity and art activist who remains committed to ensuring that art, art instruction as well as craft making and craft instruction are accessible at little or no cost to as many people as possible, Toledo himself is the link that leads us to the City of Chicago near the end of the program. In the Windy City’s Pilsen community, the magical Craft in America lens lets us peer into the National Museum of Mexican Art (NMMA) which introduced Maestro Toledo to American audiences with his first U.S. solo exhibition there in 1988. From its beginning in 1987, the NMMA, says a staff member, has adhered to the mantra of “arte sin fronteras,” that is, “art without borders” because art can “be a bridge.” It is very often, continues our Museum tour guide, what brings people together and allows them to see how much they really have in common.